At the Macworld 2008 keynote, Steve Jobs, who was Apple's CEO at the time, announced iTunes movie rentals. Movies are available for rent in iTunes Store on the same day they are released on DVD,  though iTunes Store also offers for rental some movies that are still in theaters. Movie rentals are only viewable for 24 hours (in the US) or 48 hours (in other countries) after users begin viewing them. iTunes Store also offers one low-priced movie rental a week: in the United States, this rental costs 99 cents. Movie rentals are not yet available in all countries but it is available in the United States, Mexico, the United Kingdom, Canada, Australia and New Zealand. There is a weekly promotion in which one to three songs are available to download for free to logged-in users. Free downloads are available on Tuesdays, and remain free until the following Tuesday, when the store gets refreshed with new content. Some artists choose to have select songs available for no charge. This is not available at all iTunes Stores. Some iTunes television programs have begun the same technique to encourage brand loyalty; although those stay longer. In fact, iTunes Store has a "Free TV Episodes" page where free episodes are organized by length, either as "featurettes" (shorter than 15 minutes) or full length episodes (longer than 15 minutes). Free content can vary from a preview of a show to bonus content to pilot episodes and entire seasons of TV shows (examples of free seasons include HBO's The Weight of the Nation and ABC's Pan-Am). Some networks, such as ABC and NBC, have their own pages of "Free Season Premieres". iTunes Store allows users to purchase and download items directly to portable Apple devices, such as the iPhone, iPad, Apple TV and iPod Touch. Apple offers three apps, each of which provides access to certain types of content. In response to major natural disasters, Apple provides the facility for donations to be made through iTunes Store. Unlike other iTunes purchases, donations made to charitable organisations through this system are not subject to the 30% handling fee Apple usually charges. iTunes donation pages were set up following the 2010 Haiti earthquake,  the 2011 Japanese earthquake and ensuing tsunami,  and 2012's Hurricane Sandy. In all of these cases, donations were redirected to the Red Cross. As of 2017, iTunes Store offers more than 43 million songs,   including exclusive tracks from numerous artists. Not all artists are available on iTunes, but many holdouts, such as Led Zeppelin and Radiohead, have allowed their music to be sold on iTunes Store in recent years. New songs are added to iTunes catalog on a daily basis, and iTunes Store is updated each Tuesday. Songs above 10 minutes in length are by default Album Only songs. However, this is not universally true; for example, Living in the Heart of the Beast by Henry Cow is 16 minutes and 18 seconds, yet is available for individual purchase as of December 24, 2013. In September 2009, Apple introduced the iTunes LP format (known pre-launch by the code name "Cocktail")  which features visual, interactive content alongside album tracks and lyrics. On November 1, 2006, Apple created a category for Latino and Hispanic content, "iTunes Latino". Telemundo and Mun2 made some of their popular programs available for purchase, becoming the first Hispanic television content in the store. It offers music, music videos, audiobooks, podcasts and television shows in Spanish in a single concentrated area. The brief descriptions given to the content are in Spanish as well as several subcategories. Gibraltarian Flamenco Metal band Breed 77, released an exclusive album called Un Encuentro to coincide with the launch of "iTunes Latino". It features 11 songs, all from previous albums, but all sung in Spanish. While most downloaded files initially included usage restrictions enforced by FairPlay, Apple's implementation of digital rights management (DRM), iTunes later initiated a shift into selling DRM-free music in most countries, marketed as iTunes Plus. On January 6, 2009, Apple announced that DRM had been removed from 80% of its music catalog in the US. Full iTunes Plus availability was achieved in the US on April 7, 2009, coinciding with the introduction of a three-tiered pricing model;  however, television episodes, many books, and films are still FairPlay-protected. There is a policy of censoring profanity in titles on iTunes. This has resulted in a Scunthorpe glitch, by which inoffensive titles are censored due to a coincidental string of letters. If the song has an explicit label, it will be marked "explicit" next to the song title. If a song is marked "explicit" it is unavailable for purchase if "restrict explicit content" is checked under the parental controls preference. Often there will be a "clean" mark next to the title of some songs, meaning the lyrics have been censored, and is available to purchase on all accounts. Generally if a song is marked "clean" there is an explicit version available as well. On April 28, 2004, iTunes Music Store marked its first anniversary with 70 million songs sold, clear dominance in the paid online music market and a slight profit. The store also offers hundreds of movie trailers and music videos, in an attempt to boost soundtrack sales. In the conference, Steve Jobs reiterated that a subscription service is still not in the interest of customers and reported that only 5 million of the 100 million songs offered in the Pepsi giveaway campaign were redeemed, which he blamed on technical problems in Pepsi distribution. According to an Apple press release dated August 10, 2004, iTunes Music Store was the first store to have a catalog of more than one million songs. Also, iTunes Music Store at that point maintained a 70 percent market share of legal music downloads. iTunes Music Store in Japan had 1 million songs available at start. In the next four days the store had sold one million songs – the pace faster than that of the US store. In addition to a long delay, Apple failed to have one set price for singles. Pundits[ who? ] speculated that this may have indicated the introduction of new price structure to the rest of the stores in future, in favor of record labels[ who? ] who would like to see higher prices for new songs. This extension to other countries was announced in January 2009. 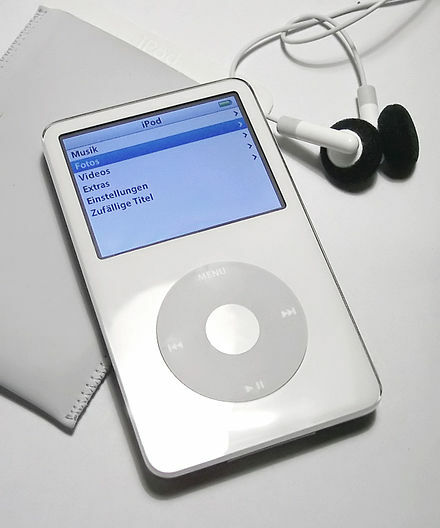 The release of video-capable iPods also saw the store launch in Australia with music videos and short films by Pixar. iTunes Gift Cards (as they are now known) are now also available in many more stores such as JB Hi-Fi, David Jones, and the Woolworths chain of stores. Access was inadvertently given to some people in New Zealand, too. Failed negotiations with the Sony BMG label meant that none of that label's artists were available at the time of launch; they were later added on January 17, 2006. On July 28, 2005, Apple and The Gap announced a promotion to award iTunes music downloads to Gap customers who tried on a pair of Gap jeans. From August 8 to 31, 2005, each customer who tried on any pair of Gap jeans could receive a free download for a song of their choice from iTunes Music Store. On July 25, 2006, Facebook and iTunes began offering a promotion where members of the Apple Students group would receive a free 25 song sampler each week until September 30 in various music genres. The idea behind the promotion was to get students more familiar and enthusiastic with each service as Autumn classes approached. However, in order to prevent abuse of the promotion, the weekly code that Facebook provided stopped working after it was redeemed one million times. In addition, the promotion caused discontent among international students, as the code was only valid in the US iTunes Music Store. On April 10, 2009, Apple announced that it will be counting down to the billionth app. Apps being the applications for iPod Touch and iPhone. Launching a counter that is constantly running on Good Friday, Apple starting counting down. Connor Mulcahey, age 13 of Weston, CT, downloaded the billionth app, "Bump" by Bump Technologies, and received a 17" Macbook Pro, a 32GB iPod Touch, a Time Capsule, and a $10,000 Gift Card for iTunes Store. Currently, iTunes is supported on the macOS (Leopard and above) and Microsoft Windows operating systems. iTunes was known to run passably well in Linux on x86-based computers using the Wine compatibility layer; however, by December 2011, this was no longer the case. Users without iTunes installed can see a content database (but not hear or view the content itself) using the iTunes Preview service, which runs inside their internet browser. This service also allows users to watch trailers for upcoming film releases. Should they choose to purchase any media, they will be redirected to iTunes. Store pages are delivered using standard HTML with a special header. This change was made when iTunes 9.0 was released. iTunes uses WebKit to render these pages on the screen. These pages are also accessible on the Web, at itunes.apple.com, allowing pages from iTunes Store to show up in search engine search results. In a related development, Apple announced on August 14, 2007 that the entire solo catalog of John Lennon would be available on iTunes. The solo catalogs of the other three Beatles, Paul McCartney, Ringo Starr, and George Harrison, are also available on iTunes. On June 6, 2006, The Consumer Ombudsmen in Norway, Sweden and Denmark launched a common open letter to Apple regarding the EULA of iTunes through the Norwegian Consumer Ombudsman Bjørn Erik Thon. The iTunes case is based upon an official complaint  filed by The Consumer Council of Norway on January 25, 2006. On July 1, 2007, the New York Times reported  that Universal (currently the world's largest music corporation) would not renew its annual contract to sell music through iTunes. Instead, Universal said that it would market music to Apple at will, allowing it to remove its songs from the iTunes service on short notice if the two sides did not agree on pricing or other terms. Apple has publicly asserted that NBC would only renew their contract if Apple agreed to a price increase of US$4.99 per episode, which they did not. NBC disputes that claim, claiming that Apple balked at NBC's request to package shows together and make wholesale pricing more flexible. NBC claims that they never asked to double the wholesale price and insisted that their shows would be sold by iTunes Store through early December. Other networks who sell their shows via iTunes did not follow suit. On December 1, 2007, NBC shows were pulled from iTunes Store. FairPlay is a digital rights management (DRM) technology developed by Apple Inc. It is built into the MP4 multimedia file format as an encrypted AAC audio layer, and is used by the company to protect copyrighted works sold through iTunes Store, allowing only authorized devices to play the content. The history of iTunes begins in 2001 and continues to the present. Initially conceived as a simple music player, over time iTunes developed into a sophisticated multimedia content manager, hardware synchronization manager and e-commerce platform. The current version of iTunes enables users to manage media content, create playlists, synchronize media content with handheld devices including the iPod, iPhone, and iPad, re-image and update handheld devices, stream Internet radio and purchase music, films, television shows, audiobooks, and applications via the iTunes Store. SpiralFrog was a music download service based in New York City that launched in the United States and Canada on September 17, 2007. SpiralFrog offered free and legal music downloads, all supported by advertising, and was the largest site of its kind in North America. On March 19, 2009, SpiralFrog terminated operations due to loan recalls. An iPod click wheel game or iPod game is a video game playable on the various versions of the Apple portable media player, the iPod. The original iPod had the game Brick included as an easter egg hidden feature; later firmware versions added it as a menu option. Later revisions of the iPod added three more games in addition to Brick: Parachute, Solitaire, and Music Quiz. These games should not be confused with games for the iPod Touch, which require iOS and are only available on Apple's App Store on iTunes. The iPod Touch is a brand of iOS-based all-purpose mobile devices designed and marketed by Apple Inc. with a touchscreen-controlled user interface. It connects to the Internet only through Wi-Fi base stations, does not use cellular network data, and is therefore not a smartphone. Similarly to an iPhone, it can be used as a music player, digital camera, web browser, note-logger, and handheld gaming device. As of May 2013, 100 million iPod Touch units had been sold since 2007. Amazon Music is a music streaming platform and online music store operated by Amazon.com. Launched in public beta on September 25, 2007, in January 2008 it became the first music store to sell music without digital rights management (DRM) from the four major music labels, as well as many independents. All tracks were originally sold in 256 kilobits-per-second variable bitrate MP3 format without per-customer watermarking or DRM; however, some tracks are now watermarked. Licensing agreements with recording companies restrict which countries music can be sold. inMusic was a Canadian music news portal and an online music store. The music store had over 2 million tracks in English and French from various genres. Samples of 30 seconds for each song were offered at no charge. Purchases and downloads could be transferred to a CD or compatible digital music device. Tapulous, Inc. was an American software and video game developer and publisher headquartered in Palo Alto, California. It was a wholly owned subsidiary of The Walt Disney Company as part of Disney Interactive's Disney Mobile unit. The company's most profitable products were the Tap Tap series of music games, which surpassed thirty-five million downloads. The App Store is a digital distribution platform for macOS apps, created by Apple Inc. This platform was announced on October 20, 2010, at Apple's "Back to the Mac" event. Apple began accepting app submissions from registered developers on November 3, 2010, in preparation for its launch. Didiom was a digital media company that specialized in the development of streaming media applications and wireless content delivery platforms. Built on peer-to-peer placeshifting technology, the company's flagship product allowed customers to stream their home computer's audio collection to their phone wirelessly, eliminating the need for data cables and memory cards. With two million songs under its management, Didiom previously launched an on-device music store that allowed customers to name their own prices for music downloads. In February 2011, Didiom was acquired by SnapOne, Inc.
1 2 "Apple Unveils New iTunes". Apple. September 12, 2012. Retrieved September 27, 2012. ↑ Langer, Andy (September 10, 2014). "Is Steve Jobs the God of Music?". Esquire . Hearst Communications . Retrieved July 10, 2017. ↑ "The algebra of iTunes". CNN. June 15, 2013. Archived from the original on June 21, 2013. Retrieved June 17, 2013. ↑ "iPhone 5 announcement: 3 important things to watch". NineMSN.com.au. September 12, 2012. Archived from the original on September 14, 2012. 1 2 Apple Inc. (March 5, 2012). "Apple's App Store Downloads Top 25 Billion" . Retrieved May 10, 2012. ↑ Knopper, Steve (April 26, 2013). "iTunes' 10th Anniversary: How Steve Jobs Turned the Industry Upside Down". Rolling Stone . Wenner Media. Retrieved July 10, 2017. ↑ England, Lucy (May 8, 2015). "Apple has a playbook for killing free music, and it was written by Steve Jobs". Business Insider . Axel Springer SE . Retrieved July 10, 2017. ↑ Locke, Laura (December 7, 2011). "Steve Jobs on the iTunes Music Store: The Unpublished Interview". Technologizer. Retrieved July 10, 2017. ↑ Hill, Brad (April 29, 2013). 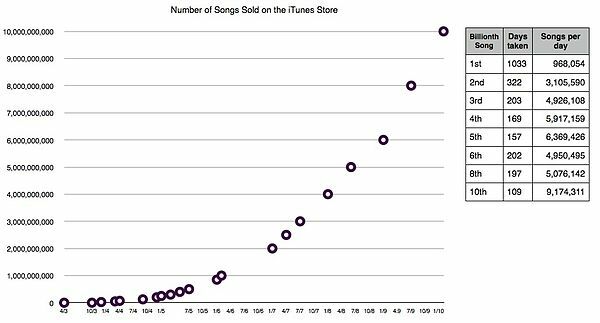 "The iTunes influence, part one: How Apple changed the face of the music marketplace". Engadget . AOL . Retrieved July 10, 2017. ↑ Chen, Brian X. (April 28, 2010). "April 28, 2003: Apple opens iTunes Store". Wired . Condé Nast . Retrieved July 10, 2017. ↑ McElhearn, Kirk (January 9, 2016). "15 years of iTunes: A look at Apple's media app and its influence on an industry". Macworld . International Data Group . Retrieved July 10, 2017. ↑ Dormehl, Luke (April 28, 2016). "Apple introduced iTunes Store 13 years ago today". Cult of Mac. Retrieved July 10, 2017. 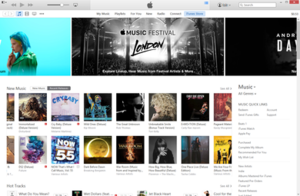 ↑ "Apple Launches the iTunes Music Store". Apple Newsroom. Apple Inc. April 28, 2003. Retrieved July 10, 2017. ↑ "Apple Launches iTunes for Windows". Apple Newsroom. Apple Inc. October 16, 2003. Retrieved July 11, 2017. 1 2 "iTunes Store Top Music Retailer in the USA". Apple Inc. April 3, 2008. Archived from the original on November 23, 2008. ↑ "Apple's iTunes serves up 10-billionth song download". Apple. February 2010. Archived from the original on May 21, 2011. Retrieved June 17, 2013. ↑ Daniel Eran Dilger (April 21, 2011). "iTunes Store quietly generates record revenues of $1.4 billion". Apple Insider. AppleInsider. Retrieved April 18, 2013. 1 2 "Apple's iTunes Store passes 35 billion songs sold milestone, iTunes Radio now has 40 million listeners – MacDailyNews - Welcome Home" . Retrieved December 30, 2016. ↑ "Apple's ITunes Overtaken by Streaming Music Services in Sales". Bloomberg.com. Retrieved 2018-07-24. ↑ "The music business is growing again — really growing — and it's because of streaming". Recode. Retrieved 2018-07-24. ↑ Warren, Tom (2018-04-26). "iTunes is now available in the Microsoft Store for Windows 10". The Verge. Retrieved 2019-01-30. ↑ Business, Heather Kelly, CNN. "Apple brings iTunes to Samsung TVs as it seeks new revenue". CNN. Retrieved 2019-01-30. ↑ iOS Developer Program Website, Retrieved October 22, 2017 Apple Inc.
↑ "Macworld: New iPhone Software, iTunes Video Rentals, Updated AppleTV". About.com . Retrieved April 28, 2009.